Recently, Star Wars celebrated its 40th year anniversary of its original theatrical release in 1977. I remember it well. I was nine years old and had seen an extremely low number of movies in my lifetime up to that point. Maybe two. One for sure. My family didn’t go to movies. We were not the entertainment type. We were the sit on the front porch and watch the neighbors type. I do remember seeing The Hiding Place in 1976, which we undoubtedly saw because of its Christian foundation. I enjoyed that movie tremendously, and re-watched it two years ago before visiting the Corrie Ten Boon house in Haarlem, Netherlands. Star Wars, however, was different. My sister, Melanie, who was seven years older than me with a drivers license, had bought into the media hype surrounding the big release and wanted to take me and my brother, who was 15. Of course the movie had never before seen special effects! It was all as mesmerizing as it could have been by word of mouth or by a small black and white ad on the next to the last page of the daily Butler Eagle. Melanie arranged a time when the car would be available and we went, most assuredly, on a Saturday afternoon of early May 1977. I remember three things about that day. The first was my brother’s doubts about the film. He downplayed its potential because “he didn’t like science fiction” films. He was such the skeptic that I wondered why he went, but I didn’t care. We were standing in line at the Penn Theater in downtown Butler with my brother’s doom and doubt sitting on our shoulders, and it was wonderful. There was excitement in the air–an opportunity to go out on the town, six miles from home without any parents, an amazingly rare treat for us back then. It turned out that Star Wars was just the beginning of an unforgettable year for me. Just one month after the opening of Star Wars, our family would have our yearly end-of-school celebration where we would go to Winky’s and eat a hamburger. That was our yearly ration of restaurant fare. Later that summer, I would attend my very first Pirates game. I still remember that they lost 4-1 with Dave Parker scoring the only run, to which I commented “Of course, he’s the only one who ever does anything.” I wouldn’t mind having that lineup back. 1977 sat large on my mind that day and would forevermore since it would also be the last year we would have with our sister Melanie, as she passed on in February of the following year. So that line, on that day, in my memory today, holds a special moment. A frozen link to my childhood that I’ll never forget. We went in and watched the film. The second thing I remember is how I was mesmerized from start to finish. It must have felt like a second in a wonderland, a million miles away from the slow-paced country life I was used to. A dreamworld where anything could come true and a small boy of nine could realize his potential in profound and unforgettable ways. Yes, it was. And it’s still one of my best memories. 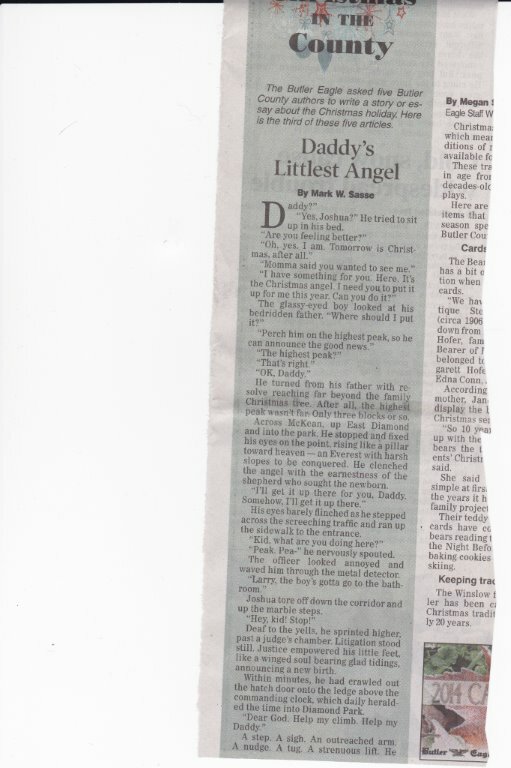 My friend back received his local paper on Christmas Eve and low and behold – a Christmas story I wrote was on the front page. Here is part one of it.